When Bowers & Wilkins released the $300 P5 Mobile Hi-Fi Headphones (4.5 rating on a 1-to-5 scale) back in 2010, the company essentially introduced a new headphone category: comfortable, high-quality, portable, on-ear headphones that—perhaps most notably—looked great. The P5’s clever Apple-esque design touches and classy, leather-upholstered style made it look like a fashion accessory for successful executives, yet it also sounded great and blocked an impressive amount of external noise, making it an ideal portable model for people who aren’t fans of in-ear headphones. In fact, Macworld gave the P5 an Eddy Award in 2010. Three years later, the P5’s influence is visible in products from many other companies: After releasing the full-size Aviator ($150) two years ago, Skullcandy recently followed up with the on-ear Navigator ($100). Meanwhile, V-Moda offers the Crossfade M–80 ($200), a smaller, more refined version of that company’s full-size Crossfade LP (also $200). RHA has attempted to make such headphones more affordable with the SA950i ($60), and even B&W has worked to broaden its reach with the P3 Headphones ($200), a less expensive version of the P5. RHA is a British headphone company that produces high-quality, attractive headphones at relatively low prices without skimping on premium features. Indeed, the SA950i looks great given its $60 price. The headband and earpads have a leather-like texture, and the glossy-black earpieces are somewhat similar to those of Skullcandy’s Aviator and Navigator. Chrome highlights grace the design as well. When I pulled the review sample out of its shipping box, I guessed that it cost two or three more than it actually does. The SA950i features a three-button, Apple-style inline remote and microphone module for controlling music and taking phone calls. The fabric-wrapped cable attaches to the left earpiece via a standard 3.5mm miniplug. Unlike the other models here, the SA950i doesn’t come with a carrying bag or case—or any other accessories—but RHA does provide a three-year warranty. Comfort is good for a model of this size, with adequate earpiece and headband padding and light weight, though the SA950i doesn’t feel as sturdy as the other models here. People with large heads should try out this headset (or any of the other three reviewed here) before buying, as its small size and sealed design put more pressure on a wearer’s ears and head than most full-size models do. For my large head, however, the SA950i exerted the least pressure of the four models I tested. The disadvantage of the less tight fit is that the SA950i offers less noise isolation than the other three headsets. The SA950i looks much better than its $60 price tag would lead you to expect. 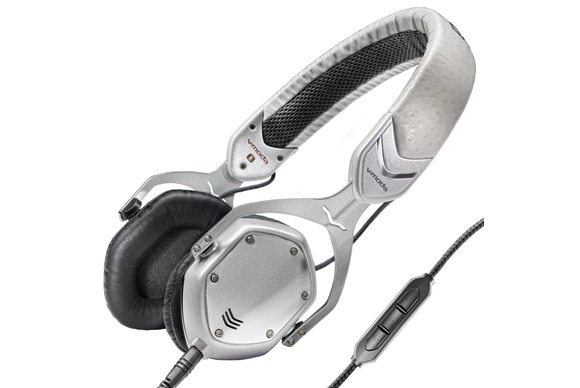 RHA designed the earpieces with the ability to pivot 180 degrees, so the SA950i can double as a set of DJ headphones. The SA950i’s cloth-wrapped cable, though a nice touch, is prone to kinking and doesn’t feel as sturdy as the V-Moda Crossfade M-80 v2’s cable. The remote’s volume buttons are helpfully raised and easy to access, but the depression for the center (play/pause/talk) button is a bit too small and a bit too recessed for reliably effective pressing. I found that the glossy-plastic earpieces scratched and scuffed fairly easily, so consider using a bag or case to transport the headphones. The SA950i looks much better than its $60 price tag would lead you to expect, and it delivers fun sound, with a slight high-end emphasis that makes cymbals sparkle. High frequencies are distinct, though they lack the realism of the treble reproduction found in higher-end models. The SA950i also has a low-end boost that provides strong bass response, including kick drums with substantial impact. Bass quality is good overall, though it possesses some of the flab that I’ve come to expect from sealed (non-in-ear) headphones. Neither the highs nor the lows overwhelm the midrange, which is pleasant and offers good detail. The headset also does a good job of communicating subtleties that give music its drive. Beyond tighter bass and better high-frequency detail, the primary thing missing from the SA950i is the je ne sais quoi of higher-end models that draws a listener fully into the music. But let’s not lose perspective here: We’re talking about an attractive set of on-ear headphones with a three-button remote/microphone and pleasant sound for $60. The SA950i is a great value. Skullcandy’s $150 sunglasses-inspired Roc Nation Aviator was the best looking headset the company had ever released. It also showed the headphone world that Skullcandy was serious about making good-sounding headphones. With the $100 Navigator, Skullcandy has downsized that stylish look, retaining some of the sophistication of the B&W P5 but adding a little edge. If the P5 is Don Draper, the Aviator and Navigator are more Indiana Jones or the Rocketeer. The Navigator features sunglass-lens-like earpieces, similar to those found on the Aviator; they’re available in solid black or white, or semi-transparent pink or (my favorite) blue. Each version comes with a color-matched headband. I miss the brown leather and gold trim of the Aviator, but these are still great-looking headphones. The Navigator’s cable attaches to the left earpiece with a 2.5mm (sub-mini) 90-degree plug that fits into a recessed port. The earpads (or “ear pillows,” as the company calls them) have a leather texture, with a mesh grille on the inside shaped like the company’s logo. The headphones also fold (again like sunglasses) into a smaller shape that fits in the included drawstring carrying bag. Skullcandy provides both a lifetime warranty against manufacturing defects and a one-year accident warranty that amounts to a 50-percent discount on new headphones in the event of accidental damage. The Navigator sounds good with sparse, acoustic music, but the headphones lost me when I listened to music with more bass. The Navigator’s fit was tight enough to be less comfortable than the RHA SA950i on my large head. Its earpads are terrifically soft, though, and the tighter fit means that the Navigator blocks more external sound than the SA950i does. I would have appreciated more padding in the Navigator’s headband, however. The Navigator’s remote includes raised hints that make each of the three buttons easy to locate and activate, and the linguine-like flat cable resists tangling. I didn’t review the Navigator’s larger sibling, the Aviator, but I very much liked it when I auditioned it briefly. Based on that experience and my extended time with the Navigator, I have to say that the latter seems like a step backward, even taking into account its lower price tag. The Navigator’s high frequencies and midrange beat the SA950i’s, offering better detail, but I prefer the SA950i overall: The Navigator produces too much bass relative to the rest of the frequency range, hampering enjoyment of midrange and treble frequencies music. The Navigator does sound good with sparse, acoustic music such as folk, but the headphones lost me when I began to listen to music with significant bass content. Unless you want big bass, to the exclusion of bass quality and tonal balance, I can’t recommend this beautiful-looking model—especially since the RHA SA950i is available for $40 less. The M-80 sounds fantastic, and its build quality is impressive. At street prices, it's a spectacular bargain. Bowers & Wilkins's P3 looks great, but unlike its standout sibling, the P5, the P3 sounds closed-in and overly bassy. The RHA SA950i isn’t perfect, but it looks and sounds great for $60. Skullcandy's Navigator looks great, but only committed bass heads should consider it.